FINE AND RARE GERMAN HAND AND A HALF SWORD C.1620. This magnificent sword was surely made to order for a wealthy and probably titled owner. It is a hand and a half broadsword made for use in one hand or two, depending on the situation. It is related to a group of swords dating to the early 17th century, mainly decorated with animal head pommels and quillon terminals. The use of human heads is less well known, but several examples exist. A notable example, evidently related to and possible by the same artisan is in the collection of the Historsche Museum, Dresden, #VI/341. Features distinctive to both examples are the form of the ears and the wedge shaped rolled collar. The base of the 32 3/4" double edged blade is decorated with a scrolling tendril from which three flowers bloom, growing from a fruit. The reference is obviously to the cycle of birth and renewal a popular theme offering hope in troubled times. Fine North European Two Handed Sword Dating To Circa 1520. A fine, rare and well proportioned North European two handed sword (hand and a half sword). The hilt, which retains much of its original blackening to the iron parts, is an impressively chiselled example of the early 16th century armourer’s craft. The flat, downwardly curved quillons, widening towards square-ended terminals, with central rope-twist decoration in raised relief on both sides, plus the deeply grooved pommel with fluted ridges, mark this sword out as a member of a distinct and unique group of North European two-handed swords. So far as we know, only six of this type are presently identified. 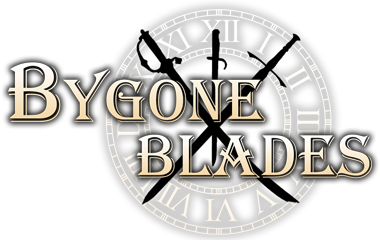 The broad blade is single edged with a thick spine beneath which two fullers each side extend from the hilt for 40% of its length, after which the blade is double edged and of lenticular section. Three crescent-shaped notches are applied at the end of the spine. An armourers mark of facing crescents terminating in ovals, with a further oval imbetween, flanked by trefoils of diamond shaped dots is present on one side a short distance from the hilt. The marks are most likely of a Passau smith. The hub of the cross is formed as a thick bar of rectangular section. The distinctive quillons are rounded nearest the block and expand in vertically flattened form towards their terminals and are decorated with raised diagonally grooved rope-like lines along the middles which are flanked by further incised lines. Two horizontal ring guard bars of thick round section are applied to the sides, each formed with two raised knops with similar “roped” finish. Beneath the cross, a downward facing round section bar of open crescent shape is applied. Two further crescents, also decorated with knops, are forged onto the terminals of this bar and rise at 45 degrees to attach to, and strengthen, the side rings. The pommel is of upturned pear shape and formed with eight equally spaced deep grooves which radiate from the pommel top to its base. The surfaces of the ridges imbetween are cut with narrow lines alternating in vertical, and diagonally vertical form, similar in depth and spacing as the lines which form the rope designs on the guard. The guard and the pommel retain much of the original blackened finish. The waisted stepped grip is of wood covered with leather over a cord wrap. The blade length is 41.5 inches (105.5 cm) and overall is 52 inches (132 cm) long. These large swords were not just for two-handed use. They were designed to be used equally well with one hand by a trained user. In the 16th century such swords were quite common on European battlefields, carried by armies fighting wars almost permanently during a time of shifting religious and political change. As fashions moved towards the beginning of the 17th century they went out of use and today are rare compared to the survival rates of two-handed swords of the “bearing sword” variety – large, well made, imposing and decorous, but designed mainly to be carried point up in civic procession rather than for use in combat. One fine example, almost identical to ours, is illustrated in “Records of the Medieval Sword”, Ewart Oakeshott, St Edmundsbury Press, 1991, page 241, which sold through Peter Dale Ltd of London before 1982. The same example is illustrated in “The Price Guide to Antique Edged Weapons”, Leslie Southwick, Antique Collectors Club, 1982, page 29, fig 49). Oakeshott comments that another sword in the Victoria & Albert Museum in London (Inventory Number M.602-1927) and illustrated in “European Swords”, Anthony North, page 6 fig 3, has an identical hilt apart from the guard having one branch. A third example is illustrated in “Edged Weapons in Sweden”, Staffan Kinman, Stockholm, 2014, page 29, fig 26b, and is similar to the British Museum example. Oakeshott comments on another in Zurich (Schweizerisches Landesmuseum Inventory Number LM 16933). A fifth sword with similar characteristics is also illustrated in Southwick (as above) fig 48, its location unknown. RARE SPANISH OR ITALIAN WHEEL POMMEL RAPIER C.1530. No single form or date can be given to the point at which the rapier evolved. 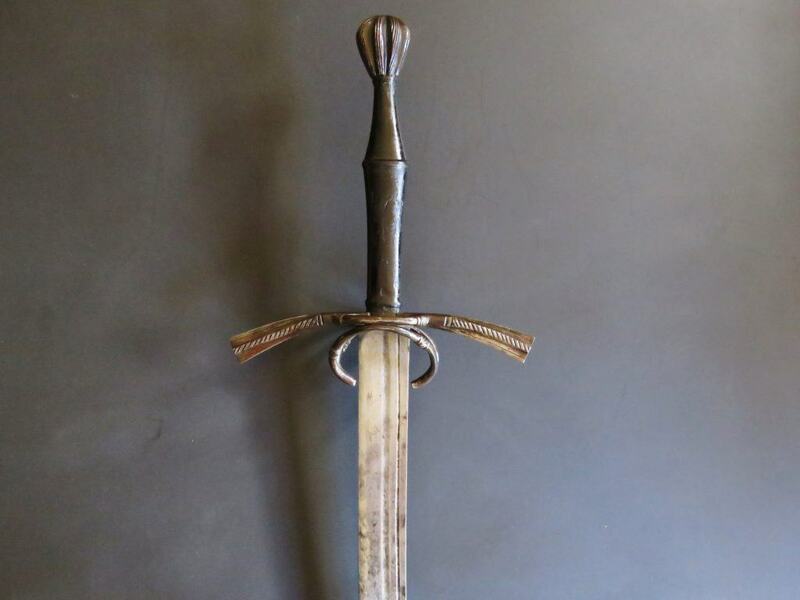 However, accepting the common definition, this example comes very close to that point, retaining the principal attributes of the Gothic broadsword, straight cross guard and wheel pommel. Its simple counter guard is identical to one on an example in the Sir James Mann collection dated to the 1520s. Other examples with variations of the guard are dated earlier, however, they all evidently have cutting/thrusting blades. The heavy diamond section blade of this example marked VALENCIA (sic.) distinguishes it as among the very earliest swords made primarily for thrusting with in respect to then evolving sword technique. 35 3/4" length blade. Allowing for the commerce in weapons, the universal popularity of imported weapons and the blade inscription, it is reasonable to conclude that it was produced for the Spanish market and as such might be linked to the conquistadors. Of the few related examples, it appears that several are in excavated condition and nearly all in public collections.